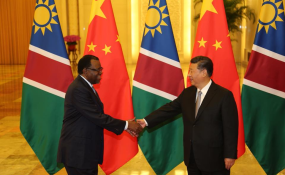 SADC chairperson and Namibian President Hage Geingob has invited China and its investment community to fund SADC projects. Geingob made the invitation at the opening of the China-Africa Cooperation (FOCAC) two-day forum that started in Beijing yesterday and is being attended by over 50 African countries. The Namibian head of state who spoke in his capacity as the chairperson of the regional economic grouping SADC invited Chinese investors to support projects in priority sectors such as manufacturing, transportation, agriculture and tourism. Various African presidents and African business leaders are attending the forum. FOCAC meets every three years to assess trade relations between China and 52 African countries. This year's meeting is being co-chaired by South African President Cyril Ramaphosa and his Chinese counterpart' Xi Jinping. The SADC chairman said along with profiling of the priority sectors and subsequent value-chain development, there is also a need for support in the development and promotion of Special Economic and Development Zones and Industrial Clusters as a key to encouraging technological development and innovation. Geingob expressed optimism that through FOCAC, SADC will develop a mechanism to support the development of its youth. "It is a fact that Africa has the youngest population in the world, and its growing at a rapid rate," he said. He said according to the UN report in 2017, the continent's youth population (aged 15-24), is expected to be more than double that of 2015, totaling 226 million by the year 2055. Geingob says such a "demographic dividend" is an asset for the continent, because alongside abundant natural resources, the young population offers enormous potential as the engine for growth in the region. He said it is against this background that SADC has set the youth as priority to advance regional development and integration, which is clearly demonstrated through the adoption of the region's 38th SADC summit theme. As such, he said the youth need to be empowered through the harnessing of skills, and entrepreneurship development. "For our youth to be the drivers of our industrialisation agenda and economic development, it is pertinent that they develop requisite competencies and capacities," he said. Geingob said the SADC region has made significant strides in-terms of youth empowerment, through on-going regional initiatives in education and skills development. One of these is the Technical and Vocational Education Training (TVET) Framework and Implementation Plan 2018-2017. The framework is intended to augment the SADC industrialisation process through provision of adequate and relevant skills for industry competitiveness and increased access to skills programmes, in order to ensure the meaningful participation of young people in the industrialisation agenda. Geingob says the need for the youth empowerment, comes at a time when the fourth Industrial Revolution has made its impressive entry within societies and even human body, through a number of fields, including robotic, artificial intelligence, nanotechnology, quantum computing and biotechnology. He called on the Chinese business community and investors to contribute to youth empowerment in SADC by promoting business and investment in the areas of Research and Development and Innovation, Science and Technology.